At the end of this month we will celebrate the 498th anniversary of the Protestant Reformation when we remember that on that first “Reformation Day” (October 31, 1517) Martin Luther nailed his 95 Theses to the church door at Wittenberg. He challenged the religious establishment to a debate about the facts of the gospel and the Christian life, appealing ultimately to the Scriptures as the sole infallible authority for the believer in matters of faith and practice. We are continuing our look at the key distinctives of the Reformation, known as the Five Solas. What are the Five Solas? How do we relate to them today? How are we actively carrying on in the spirit of the reformation? Answering these questions will tell us where the reformation is today. In proclaiming the truth that salvation is by grace alone we understand from the same text, Eph 2:8-9, that God gives with His grace the faith we need in order to believe Him and obey the gospel. Our justification is solely by faith. It is not faith that is alone (faith without works), but by active, living faith alone (faith that works). 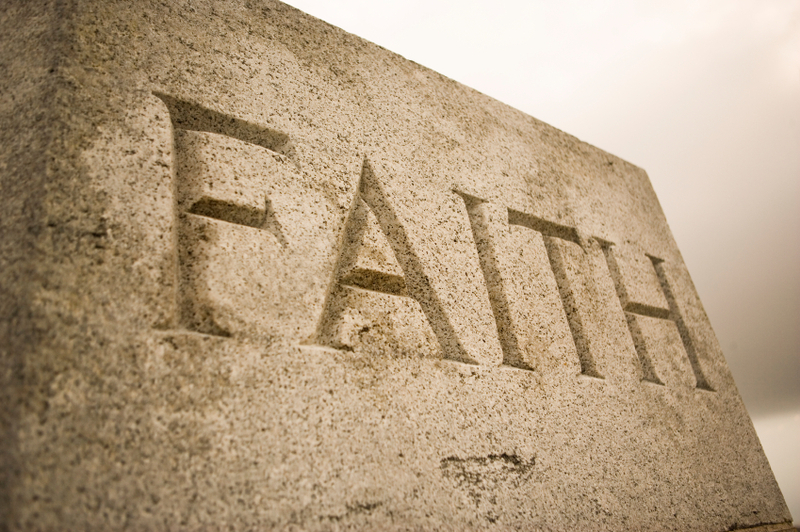 It is not by the works that faith accomplishes. It is by the instrumentality of that gift, by faith alone, that we are made righteous before God. Romans 5:1-2 – Therefore, having been justified by faith, we have peace with God through our Lord Jesus Christ, through whom also we have access by faith into this grace in which we stand, and rejoice in hope of the glory of God. Galatians 2:16 – …knowing that a man is not justified by the works of the law but by faith in Jesus Christ, even we have believed in Christ Jesus, that we might be justified by faith in Christ and not by the works of the law; for by the works of the law no flesh shall be justified. Q. What is justification? A. Justification is an act of God’s free grace, wherein he pardons all our sins (Rom. 3:24; Eph. 1:7), and accepts us as righteous in his sight (2 Cor. 5:21) only for the righteousness of Christ imputed to us (Rom. 5:19), and received by faith alone (Gal. 2:16; Phil. 3:9). Those whom God effectually calls He also freely justifies, not by infusing righteousness into them, but by pardoning their sins, and by accounting and accepting them as righteous, not for anything wrought in them, or done by them, but for Christ’s sake alone. They are not justified because God reckons as their righteousness either their faith, their believing, or any other act of evangelical obedience. They are justified wholly and solely because God imputes to them Christ’s righteousness. He imputes to them Christ’s active obedience to the whole law and His passive obedience in death. They receive Christ’s righteousness by faith, and rest on Him. They do not possess or produce this faith themselves, it is the gift of God. Faith which receives Christ’s righteousness and depends on Him is the sole instrument of justification, yet this faith is not alone in the person justified, but is always accompanied by all the other saving graces. And it is not a dead faith, but works by love. Christ, by His obedience and death, fully discharged the debt of all those who are justified, and by the sacrifice of himself through the blood of His cross, underwent instead of them the penalty due to them, so making a proper, real, and full satisfaction to God’s justice on their behalf. Yet because He was given by the Father for them, and because His obedience and satisfaction was accepted instead of theirs (and both freely, not because of anything in them), therefore they are justified entirely and solely by free grace, so that both the exact justice and the rich grace of God might be glorified in the justification of sinners. From all eternity God decreed to justify all the elect, and Christ, in the fullness of time, died for their sins, and rose again for their justification. Nevertheless, they are not personally justified until the Holy Spirit, in due time, actually applies Christ to them. God continues to forgive the sins of those who are justified, and although they can never fall from the state of justification, yet they may because of their sins, fall under God’s fatherly displeasure. In that condition they will not usually have the light of God’s countenance restored to them until they humble themselves, confess their sins, ask for pardon, and renew their faith and repentance. The justification of believers during the Old Testament period was in all these respects exactly the same as the justification of New Testament believers. Faith is a work of God in us, which changes us and brings us to birth anew from God (cf. John 1). It kills the old Adam, makes us completely different people in heart, mind, senses, and all our powers, and brings the Holy Spirit with it. What a living, creative, active powerful thing is faith! It is impossible that faith ever stop doing good. Faith doesn’t ask whether good works are to be done, but, before it is asked, it has done them. It is always active. Whoever doesn’t do such works is without faith; he gropes and searches about him for faith and good works but doesn’t know what faith or good works are. Even so, he chatters on with a great many words about faith and good works. Faith is a living, unshakeable confidence in God’s grace. This kind of trust in and knowledge of God’s grace makes a person joyful, confident, and happy with regard to God and all creatures. This is what the Holy Spirit does by faith. Through faith, a person will do good to everyone without coercion, willingly and happily; he will serve everyone, suffer everything for the love and praise of God, who has shown him such grace. It is as impossible to separate works from faith as burning and shining from fire. Therefore be on guard against your own false ideas and against the chatterers who think they are clever enough to make judgments about faith and good works but who are in reality the biggest fools. Ask God to work faith in you; otherwise you will remain eternally without faith, no matter what you try to do or fabricate. In Romans chapter 5, St. Paul comes to the fruits and works of faith, namely: joy, peace, love for God and for all people; in addition: assurance, steadfastness, confidence, courage, and hope in sorrow and suffering. All of these follow where faith is genuine, because of the overflowing good will that God has shown in Christ: he had him die for us before we could ask him for it, yes, even while we were still his enemies. Thus we have established that faith, without any good works, makes just. Justification is by grace alone through faith alone because of Christ alone. This is the article by which the church stands or falls. Today this article is often ignored, distorted or sometimes even denied by leaders, scholars and pastors who claim to be evangelical. Although fallen human nature has always recoiled from recognizing its need for Christ’s imputed righteousness, modernity greatly fuels the fires of this discontent with the biblical Gospel. We have allowed this discontent to dictate the nature of our ministry and what it is we are preaching. Many in the church growth movement believe that sociological understanding of those in the pew is as important to the success of the gospel as is the biblical truth which is proclaimed. As a result, theological convictions are frequently divorced from the work of the ministry. The marketing orientation in many churches takes this even further, erasing the distinction between the biblical Word and the world, robbing Christ’s cross of its offense, and reducing Christian faith to the principles and methods which bring success to secular corporations. While the theology of the cross may be believed, these movements are actually emptying it of its meaning. There is no gospel except that of Christ’s substitution in our place whereby God imputed to him our sin and imputed to us his righteousness. Because he bore our judgment, we now walk in his grace as those who are forever pardoned, accepted and adopted as God’s children. There is no basis for our acceptance before God except in Christ’s saving work, not in our patriotism, churchly devotion or moral decency. The gospel declares what God has done for us in Christ. It is not about what we can do to reach him.